Most people assume that baby teeth aren’t as important as adult teeth since we lose them early in life. But the truth is that baby teeth really do matter for a variety of different reasons. An infant’s 20 primary teeth are already in place within the jaws at birth. They start to appear between 6 months and 1 year of age. The emergence of baby teeth often results in sore gums that can be alleviated with gentle rubbing. The average child will have all 20 primary teeth in place by the age of 3. Primary teeth are critically important as they help our little ones chew food and form words. Baby teeth also hold space for permanent teeth that will soon emerge from beneath the gums. 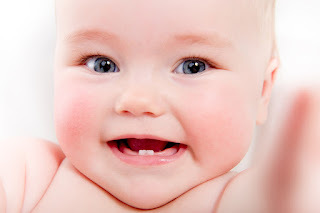 If a baby tooth is lost prematurely, the adjacent teeth might drift into the empty space, making it challenging for adult teeth to find space when they finally come in. This is one of many reasons why taking your kid to a child’s dentist early in life is so important. According to the American Dental Association, the first dental appointment should be scheduled within six months after the child’s first tooth comes in. Do not wait until beyond your child’s first birthday to have him or her seen by a dentist. This visit will give your dentist a chance to check your kiddo’s teeth for decay and other issues. It is imperative that you take care of your child’s baby teeth from the get-go. The first step is to wipe your baby’s mouth in the first couple of days after birth. Use a washcloth or a moist gauze pad for this quick rub. If your child is under the age of 3, brush his or her teeth three times per day and floss where teeth touch, as soon as the teeth have entered the mouth. Use fluoride toothpaste the size of a lentil. If your child is between 3 and 6 years old, use a little bit more toothpaste, roughly the size of a small pea and brush three times per day and floss where the teeth touch. Continue brushing your child’s teeth until you are confident that he or she can brush them on his or her own. Kids start to get sufficient hand-eye coordination around the age of 8. If your child wants to brush and floss on his or her own, that’s great! Let he or she brush and floss, then an adult should follow up behind. An adult can brush and floss first, whichever method works best to get the job done. Once your child has two teeth that touch, you can teach him or her how to floss! Encourage your child to floss each time he or she brushes to maintain oral health into adulthood. And don’t forget to schedule regular dental appointments at Playtime Dental.